TEHRAN, Iran, November 17, 2010 (ENS) – Pollution is contributing to falling catches in Iran’s Caspian fishing industry, local fishermen say. They complain that restrictions preventing them from going out to sea mean they are unable to catch more than a tiny fraction of what their counterparts in other states around the sea achieve. The six-month Caspian fishing season got under way in October, with more than 11,000 fishermen using the traditional “pareh” or seine netting method to catch mullet close to the shoreline. It is cold, hard work. Once the 1,000-metre net has been taken about two kilometres out to sea in small boats, it has to be dragged back onto the shore by men standing in the water, and sometimes by tractors. Mojtaba said fishermen typically live for only a few years after they retire, as arthritic pain and renal and respiratory diseases age them prematurely. Mojtaba’s firm is one of 150 local cooperatives along the Caspian shore that employ a total of 11,000 fishermen. Many are unhappy with government rules preventing them from going further out to sea, saying this puts them at a massive disadvantage compared with the commercial fishing operations run out of some of the other coastal states, Russia, Azerbaijan, Turkmenistan and Kazakstan. Another fisherman noted the steady decline in the already modest catch. He said the fishermen who make up the cooperative’s shareholders were now receiving the equivalent of 500 dollars monthly. “So our wives have come to our aid by working – farming or raising livestock,” he added. For these fishermen operating legally, the presence of unlicensed net fishers is an added aggravation. The authorities say they lack the manpower to patrol coastal waters properly and curb poaching. Others say the mullet, which accounts for about 90 per cent of their catch, are showing increasing signs of poor health, and they come across hundreds of dead ones in the course of a day. They blame pollution of the Caspian’s waters, including a failure to control the dumping of sewage in the Iranian sector. Hossein Habibnejad, chief executive of the Mazandaran branch of the state Iranian Fisheries Organisation, argues that the slump in fish catches is merely a temporary phenomenon caused by climatic conditions. These fishermen are not involved in pursuing the Caspian’s most famous fish – the various species of sturgeon that produce valuable caviar – although some admit to illegally selling any that land in their nets. Caviar from one fish can be worth thousands of dollars. Aminollah Taghavi-Motlagh, the head of Iran’s Fisheries Organisation, said this summer that Iran accounted for 45 percent of all caviar exports, in other words much more than any one of the other Caspian states. 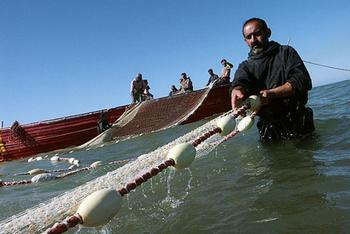 Half of Iran’s caviar comes from sturgeon caught on the eastern stretch of shore from the Hassangholi Gulf to Miyankaleh. The five countries agree annually on how much caviar from six sturgeon species they will each export. Taghavi-Motlagh’s agency posts inspectors in each cooperative to watch out for sturgeon that get caught in their seine nets. Whenever that happens, the inspector keeps a close watch to ensure the fish is transported untouched to the fisheries’ office. Any fisherman who slits it open and takes the caviar can expect a harsh penalty. In return for the sturgeon, the cooperative receives a payment, but this pales in comparison with what illegal caviar traders are prepared to pay, and many fishermen give into the temptation.